There's a saying that I like that says that to begin understanding something, start by learning what it's called. 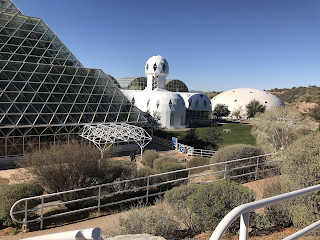 And while I'm not usually fussy about names, because a rose by any other name would smell as sweet, the best way to begin to understand what most people call "the Biosphere" in Arizona, down near Tucson, is to call it by it's proper name which is Biosphere Two. And if you're looking around and wondering where the Biosphere One is, you're standing on it, it's earth, also known as the Big Blue Marble. And that's the point of Biosphere Two, to see if something could be man-made that could support life, both plant and animal, out in space. Like earth does, only smaller. The Biosphere Two was built in the late 1980s, and like most people who live in Arizona, I've never gotten around to visiting it. I plan on seeing it this weekend, and like all of the places I visit "In Real Life" I start with some exploring in cyberspace. I think I'm going to like it. I've always had a fascination with stories about space travel, and as a kid I followed the moon shots, and landings. I've read a lot of science fiction, and the thought of traveling in space, and what it would look like and feel like, for long periods, fascinates me. And really, the Biosphere One is the same as Biosphere Two, except that it's bigger, and there are whales in the ocean, and it has bigger trees. Today I will be pondering this as I walk around Biosphere One, looking at the sky, the flora and fauna, and realizing that it's just like Biosphere Two, a bubble of life floating through the cosmos.